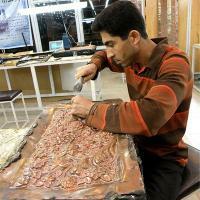 Mr. Razi's first job is in technical field. 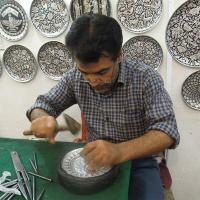 However, he does repousse and chasing in his small workshop in the city of Mashhad. Traditional arts have always been passed on from one generation to the next. Enameling or Minakari is a method of painting and ornamenting the surface of metals such as gold, silver and copper by fusing enameled colors over it. Mina is the feminine form of Minoo in Persian, meaning heaven. Hammering has been common in Iran since 5000 B.C. In old times, it was the craftsman’s job to turn the bullion and copper parts into copper sheets, shape it like a container and hammer. Different hammers are applied through the whole process. Repousse and chasing is shaping and ornamenting metal using a hammer. 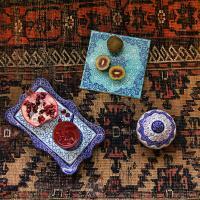 It is a traditional art which goes way back to Medes in Iran. Archaeologists believe that copper is the first metal that attracted human’s attention to apply in repousse and chasing. Textile printing is the art of applying color to fabric by hand to create patterns on it. 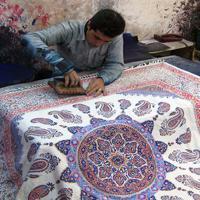 Textile printing is a traditional Iranian art and a common business in Isfahan. Patterns are printed on the textile with an engraved wooden block.These wooden blocks need to be resistant, solid and inflexible, therefore they are usually made of pear tree. Haj hoseini has worked in turquoise mines for over 40 years. Recently he is managing one of the mines with his sons. 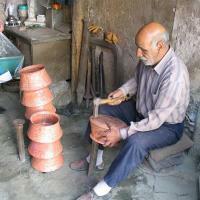 He and his sons do all the work from mining to cutting and polishing the turquoise. 50 years ago a shepherd in a nomadic village finds a stone with an image of a tree on it. The shepherd collects some of these stones and brings them home with him. One day a man from town visits the shepherd to buy a sheep. He becomes mesmerized by the stones while staying at shepherd’s house as his guest. He becomes so interested that he offers the shepherd dates in exchange for stones.